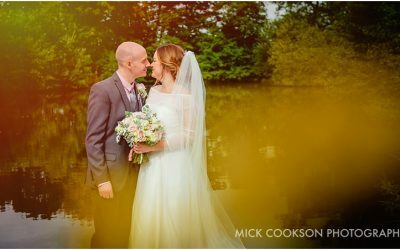 Here is another example of my Styal Lodge Wedding Photography; Lorna & Hamid were married recently at St Peter’s Church in Prestbury, with a Persian ceremony and traditional wedding breakfast at Styal Lodge. Lorna and her bridesmaids were having their preparations at Kingsley Lodge – a stunning, exclusive boutique hotel in Wilmslow – about ten minute’s drive from Styal. The ceremony was brilliant fun, Lorna even had to bite Hamid’s finger as a sign of trust…erm…. With drinks and canapes in full flow, we headed off to the lake for a few minutes of portraits, and a little chill-out time, and back via the garden for a few more snaps, we headed in to the wedding breakfast, beautifully laid out in a stunning style (no pun intended!) by the fantastic Pink Pepper caterers, headed by the lovely Sarah & Neil. These guys really are top drawer – a must shortlist for your wedding. After the cake cutting, tha dancefloor filled. We had to clear it after an hour to let the newlyweds have their first dance. I must admit, the music was addictive, but I refrained from demonstrating Class 1 Dad Dancing to 80 guests….phew! So congratulations Lorna & Hamid, and thank you for inviting me to be your wedding photographer.